Culms: Erect to somewhat bent below, solid, glabrous, leafy at bases. Blades: Numerous, flat, slender, 1 to 7 inches long, less than 1/10 inch wide, erect or ascending, rough or glabrous; lower margins with hairs arising from tiny bumps. Sheaths: Glabrous or finely hairy, bearing long soft hairs near ligule. Inflorescences: Panicles; branches 1 to 4, .5 1.5 inches long, occasionally curved; rachis extending conspicuously beyond spikelets in obvious point. Spikelets: 18-50 per branch, .25 inch long, crowded in 2 rows; florets 1 perfect, 2 sterile; glumes unequal, tipped with blackish awns, second glume hairy; fertile lemma deeply 3-cleft, hairy, 3 short awns, central awn longest. Habitat: Prairies or pastures, on dry, shallow, sandy or rocky sites. Forage Value: Hairy grama is nutritious for livestock and has high palatability late in the growing season. 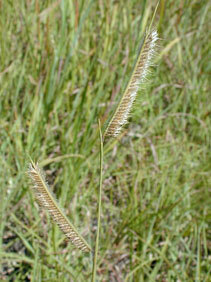 Comments: Hairy grama grows in tufts but does not occur in large stands. Hairy grama can be distinguished from blue grama by the needle-like rachis that projects beyond the spikelet-bearing portion of the branch.